If you’ve landed on this page I know you likely don’t want to “do one thing each day that scares you” or “live life outside your comfort zone”. You already spend a good portion of your days trying to fit into a society catering to extroverts. What causes a few butterflies for some may put you into a full-on panic and running a business doesn’t need to be that scary. You want to be successful but do you have to be willing to walk around in a cold sweat, dreading interviews, struggling through networking events and searching for excuses valid enough to turn down nerve-racking opportunities? Not if I have anything to do with it! You’ve had enough of the emotional rollercoaster: I can do this…I can’t do this…I know what I’m doing…wtf am I doing?! You can run a successful business without changing your stripes or being uncomfortable everyday. It’s time we work with the traits that make us who we are instead of wallowing over who we aren’t and following a pack we don’t belong in. This isn’t just a guide for introverts. It’s for anyone tired of reading advice from entrepreneurs who are “fearless” in their endeavors. Shy, quiet, introverted, sensitive, anxious, nervous, all of the above or none of the above, you’ll find value in this ebook. That’s because it’s not focused on specific personality traits. It’s focused on helping you build a solid business from the ground up, regardless of your traits. And it just happens to promote ideas that put the spotlight on your business, not you. Having confidence in yourself as a business owner and knowing you got this! I know there’s a lot of information out there and you may feel discouraged after reading multiple articles or signing up for a course. You’ve been excited about their promises, only to discover advice you don’t feel comfortable taking. Most courses want to push you out of your comfort zone to take the same steps to success the teacher has. But everyone is different and success requires more than following someone else’s path. I fill my ebooks with loads of ideas, lessons, examples and worksheets so you have options to choose from, a deeper understanding of each method and questions to get you considering how to make an idea work for you. You’ll build your own plan based on your strengths, interests, goals and comfort level. If you’re not yet convinced this ebook is for you, sign up for our Newsletter to receive the first chapter and 25 ideas for marketing your business without having to say a word. 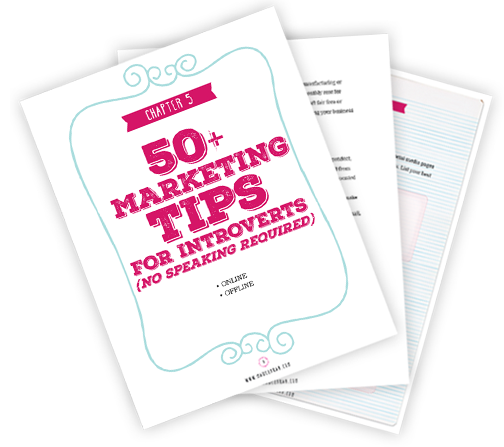 The full ebook has over 50 ideas to silently market but I’ll share 25 of them in the free sample. You’ll also get to check out the first chapter, which is all about uncovering your strengths and weaknesses and solving PROBLEM #1 mentioned below. The information in this chapter will be useful whether you decide to purchase the full ebook or not. WHAT WILL THE SUCCESSFUL INTROVERT HELP ME WITH? When you constantly focus on your shortcomings and trying to overcome obstacles, you’re fighting a losing battle. Your competitors seem to excel with very little effort because they’re putting their strengths to use while you’re dealing with an Achilles heel and struggling to keep up. Many people wish they were more like others while ignoring their own superpowers. Imagine Thor saying “Oh that? That’s nothing, just a stupid hammer” while putting himself down for not having the Hulk’s incredible strength. The first chapter is all about identifying the traits that can help or harm you in business. I’ll show you how to discover valuable attributes hidden within, make better use of your skills and find your own “easy button” for success. You may think you know all your strengths and weaknesses but keep an open mind. For years I overlooked my achievements as a writer. I ignored the traffic and revenue opportunities that could have been generated from writing and beat myself up because I dreaded promoting my business through press and networking events. Meanwhile, there were thousands of people reading my articles each month, comments sharing how helpful they were and readers asking for more. I soon realized I had been focusing my attention in the wrong direction and was a more powerful, confident and happy business owner when I concentrated on writing. If your products aren’t spectacular and you’re uncertain of your audience, you’re working backwards and making business harder than it needs to be. It’s like planning a party but baking the cake before you know who the party is for and if anyone can make it. The first step in party planning is knowing who your guest will be, where to reach them and their common interests. From there you can create a theme, send out invites and then start planning the cake. Ensure you’re targeting a profitable audience and creating products that are a fit. It’s easier to have a clear picture of your customer in mind throughout the process than consider their needs and where to find them after you’ve built your product. And if you already have a profitable product, there are still small details you can alter to take it to the next level. Everyone has an opinion on which platforms are best for marketing and where you have to sell your products. Keeping up with all of them will drive you crazy and you’ll end up with several average revenue streams instead of a few amazing ones. I cover the different platforms for marketing and selling your products, online and off. I’ll help you determine which are a fit for your business and how to ensure success using them. Sometimes it requires taking a step back to assess what’s really working for your business and where you should focus your time. I more than doubled traffic and revenue when I re-evaluated my efforts. There are a million and one ways to market your business but I’m sure most of them put knots in your stomach. Offering to guest speak at a conference or sending a press release to local TV stations are good ideas in theory but probably not something you’ll be comfortable with. And when your heart isn’t in what you’re doing, your results are going to reflect that. I’ve put together over 50 ideas to market your business, online and off, that don’t require you uttering a single word. How exciting is that?! There are times when opportunities are presented and they’re just too good to pass up. It scares the crap out of you but you know you have to do it. It may be a networking event, public speaking opportunity or a live interview. You’re nervous the second you say yes, spend upcoming weeks losing sleep, stressing over “what-if’s” and waiting for it to be over so you can vow to never do it again. I’ve been there, done that and dedicated hours of my life to researching ways to lower stress levels when you’re in the middle of an anxiety attack. It’s no joke and “picturing the audience in their underwear” does nothing to stop your heart from feeling like it’s about to burst out of your chest. I’ve shared over 50 effective tips and tools to help you prepare and stay calm before, during and after any nerve-racking event. Each chapter has a worksheet section so you can apply the lessons you’ve learned. I want you to get something out of this ebook and that won’t happen if you simply read my advice but don’t reflect on how it can work for your business. The questions will get you digging deep and brainstorming ways to take sales to the next level. I’m Erin, founder and one of the creative minds behind MadeUrban.com. I’ve been in the crafting industry over a decade now, with 2005 being the year of my very first craft fair. I started as the poster child for “small business don’ts” and grew into a successful handmade business owner selling full time through craft fairs, online and wholesale accounts. That small business led to my current dream career of helping others with their creative businesses and having over half a million people read my articles and ebooks in the past two years. Oh, and I also get to work for the cuddliest boss in the world… my cat Josh. I’m not a fan of “if I can do it, you can too!” assurances but in this case, I do stand behind it. I’m someone who has dealt with all kinds of challenges at different stages (painfully shy, socially awkward, introverted, anxiety ridden, depressed and even suffering from panic attacks). But despite my shortcomings I’ve succeeded at all kinds of public and media relations (giving presentations, running workshops, networking and conducting every type of media interview; live, pre-recorded, television, radio, magazines and newspapers). I’m now working on a business I love, am confident and comfortable each day and earn an income way above what I ever made working for a large corporation. So whether you’re feeling like the odd man out because of your traits, are dealing with anxiety before a craft fair or are simply looking for some ideas to improve your business, I’ve got you covered. I want nothing more than to see your small business succeed and to share every bit of information I can to help you along the way. I hope you love reading my advice as much as I love sharing it. 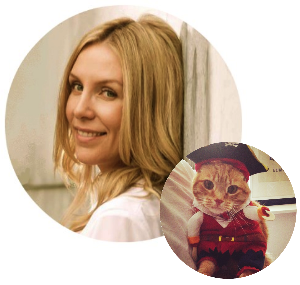 If you have any questions about the book, my articles, Made Urban or cats, I’d be happy to answer them! I DON’T DEFINE MYSELF AS AN INTROVERT, WILL YOUR ADVICE STILL BE HELPFUL? I know everyone is different and just because you’re quiet doesn’t mean you’re shy. Just because you’re shy doesn’t mean you’re introverted. And just because you’re introverted doesn’t mean you’re socially awkward. You may be fine in front of hundreds of people and able to deliver an amazing speech but require alone time afterwards. Or you may feel stressed in a room with strangers and require a night out with friends to unwind. I’m not trying to put you inside a box or explain the inner workings of an introvert. 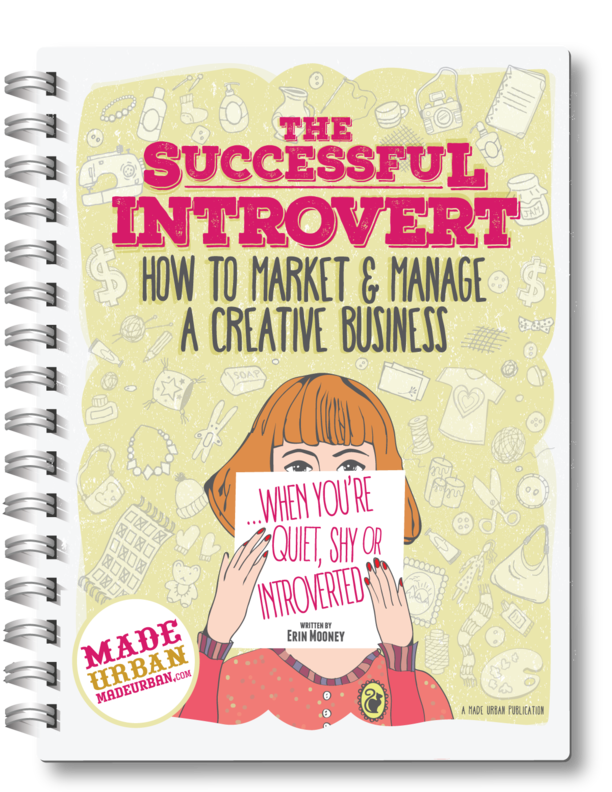 Although “Introvert” is in the title, it’s a restrictive noun for the broad range of people this ebook can help. I don’t spend time talking about what it’s like to be an introvert or who an introvert is and isn’t. I use this ebook as a tool to help you discover ways of marketing your business and selling your products without having to spend a lot of time in large groups or speaking in front of large audiences. You also don’t need to spend large amounts of money to get your message heard. Whether you’re shy, sensitive, quiet, an over-thinker, introvert or even extrovert, you’ll find ways to work with your strengths and perfect what, where and how you’re selling. WHO IS THIS EBOOK NOT FOR? I don’t go into “the top traits of an introvert”, spend time dissecting them or praising one type of personality over another. If you’re looking for a detailed explanation of the traits possessed by introverts, this ebook is not for you. WHY BUY YOUR EBOOK WHEN THERE’S SO MUCH INFO OUT THERE FOR FREE? I know there’s an entire Internet for you to explore and gather information. I personally feel a little lost when I bounce from article to article without a cohesive plan and love when I find a start to finish guide to follow. Have a look at the NEWS page to get an idea of the type of advice I share. I know you may be skeptical about purchasing an ebook, worried it’s full of ideas you’ve already heard. But I make it my mission to always think outside the box and provide value when it comes to my writing. If you like the advice I share in my free articles,I’m confident you’ll find value in my ebook. I’VE BEEN IN BUSINESS FOR A FEW YEARS; WILL THIS E-BOOK STILL BE USEFUL? I believe there’s always room to improve your business. Whether you’re still in the planning stage or are in full swing, you’ll find thought-provoking ideas to take your business to a new level. I SELL A SERVICE, NOT A PRODUCT. WILL THIS EBOOK STILL BE USEFUL? Although THE SUCCESSFUL INTROVERT speaks to creative business owners selling a product, the information is still helpful to businesses offering a service. There are a couple areas that won’t apply to you but the bulk of the book will. DO YOU OFFER A PRINT VERSION? Not at this time but we may in the future. I’ve had several people print their e-books and put it into a binder as an option. Please let us know if you’d be interested in the print version as the more requests we get, the more likely we are to invest in printing. I am not a psychologist and am in no way giving advice to deal with or treat anxiety disorders. This is an ebook offering small business advice. It does not guarantee the success of your business and the results you achieve from purchasing THE SUCCESSFUL INTROVERT will depend on your business, the work you put in, the techniques you apply and about a hundred other factors. Your results will vary. Copyright Made Urban 2019. All Rights Reserved.